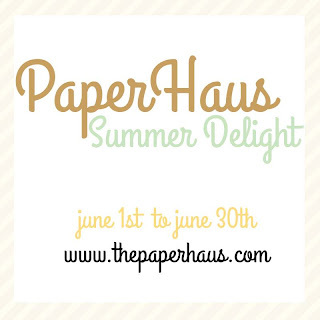 Welcome to the PaperHaus Magazine Summer Delight Blog Hop! We are excited that you are hopping with us and we would like to thank you for hopping along! We are celebrating the release of the Summer Issue of PaperHaus Magazine! There is SO much inspiration, techniques, projects, and exclusive artist interviews inside! Not only that but it’s an issue filled with amazing Mixed Media projects from people from all over the world! We hope you enjoy flipping through the pages as much as we enjoyed putting it together for you! Below is the link to the summer issue, simply click on the cover to go there now! BUT Come back as I have a canvas to share with you, and a Giveaway too!! We hope you were inspired, and here is some more inspiration too! Our Summer Delight event is all about fun summer days filled with scrapbooking and crafting! We want to share with you what we have made! 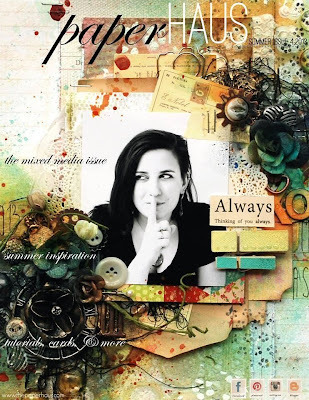 Every day on the PaperHaus Blog there will be amazing inspiration and tutorials so be sure to stop on by every day in June! Now, before I get to the Giveaway I have for you, I would like to share with you a canvas that I created for the hop today! This is a gift that I created for one of my life-long best friends Carrie and her sweet daughter Alma (who is my goddaughter). I took this photo of them on Alma's baptism day and have been wanting to do something ever since. To have the responsibility as a godmother is something I take with such honor and I hope to always be there for this little girl- in many ways, but most importantly spiritually :). Thanks so much for taking a peek at my project :)~! NOW- on to my Giveaway! 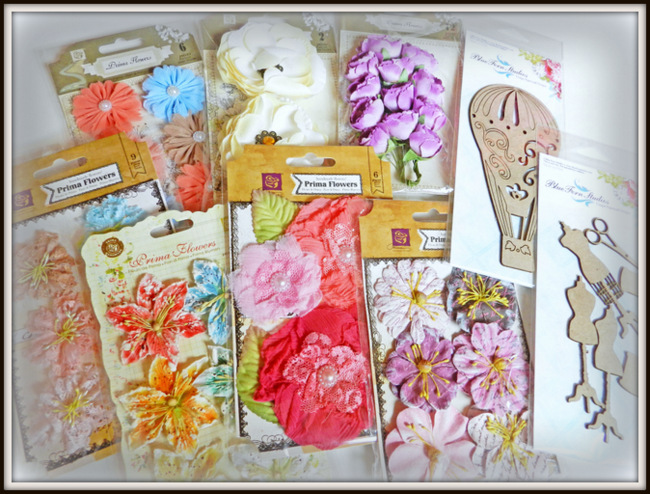 One lucky hopper will win this collection of Prima flowers and Blue Fern Studios chipboard~! 2. Leave a comment on this post! 3. (Optional) I would love it if you would "Like" my Facebook page! My winner will be posted THIS WEEKEND- so keep an eye open! 6. Erin Blegen- http://erinblegen.blogspot.com <---YOU ARE HERE! Your friend was very lucky to receive such a fabulous canvas! GORGEOUS canvas, such perfect colors for a mama and baby projects and thanks so much for the chance to win, love that chipboard balloon! What a gorgeous gift Erin!! 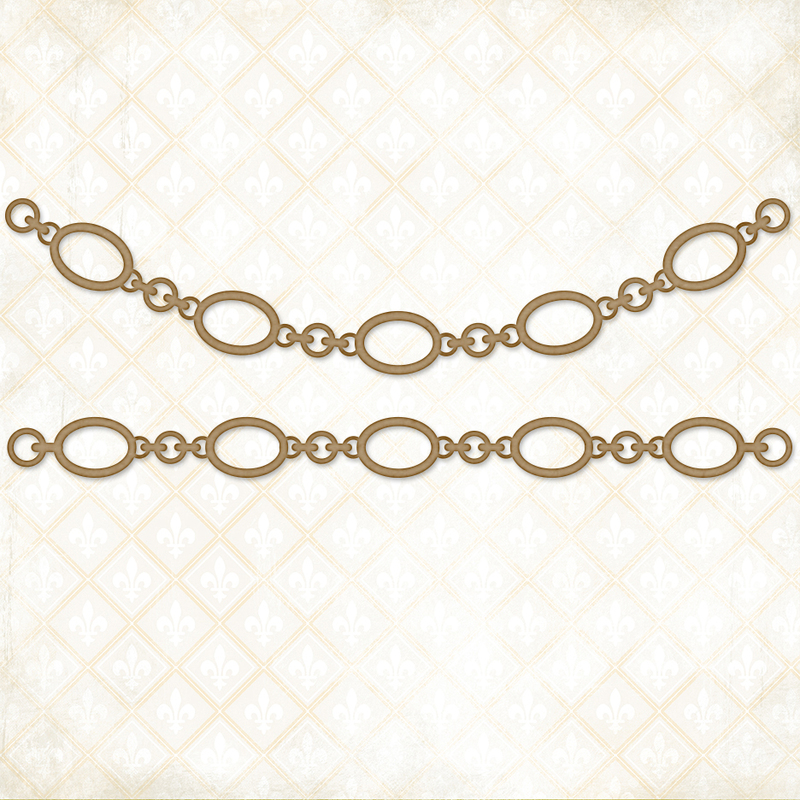 I love the way you used the Page Chains on this!! your friend must be very happy to see such a wonderful canvas . such pretty lil details.nice chains over there, first time seeing those.glad to be your follower. Beautiful Beautiful Beautiful. I love the little details! Such a sweet photo and beautiful background to match it. you know, I love your pages Erin! 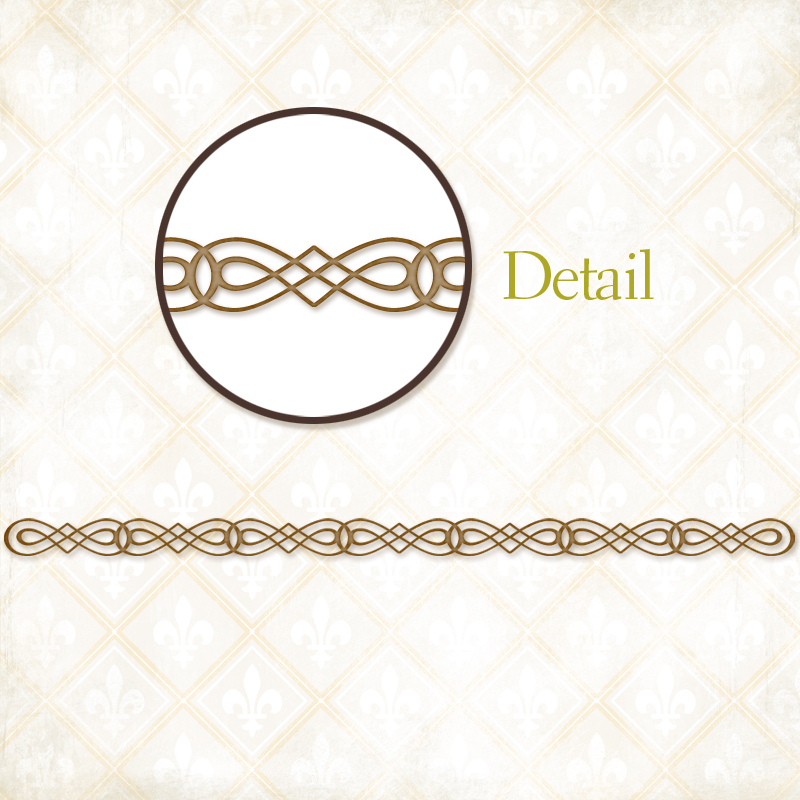 I love the color palettes you use and all the details. thanks for inspiring me again! What a lovely gift for your friend and your God daughter, I'm sure this canvas will be cherished for years to come! Gosh, it's such a gorgeous canvas! I truly love how you used the chippies. I'm sure your friend loved this. Thank you so much for the chance to win this amazing giveaway too! um...WOW!! I'm stunned---this is beautiful!! I'm a new follower, through email. already following. This layout is stunning! i love all of the texture and your colorful clusters are really gorgeous--love the pieces dangling down, too!!! really great work and thanks for a chance to win, too! У вас очень интересные работы! I'm following thru e-mail. I will "like" you on FB. I love the page. the colors are so soft and sweet. The chain and the flowers really highlight the picture. They don't over-power the main subject. thanks for sharing. Your canvas is gorgeous!!! Love it1 I follow you through Bloglovin where my name is Karen Beitzinger Schroeder and email is fossilsrock@hotmail.com. The canvas is beautiful! I know it will be treasured! I'm just drooling over these colors, and yuuum, the flowers. Beautiful canvas and a beautiful thing to do for your friend and goddaughter. I'm sure she's in love with what you've created for her. Thank you for sharing the story with your art. Love the chains and how you put little pieces of sparkles, etc on them! I am a new subscriber by email. Love your work Erin!!!! !Stunning as always!!! this is a beautiful canvas. (And baby.) Love the color, texture, and detail of your page. Your embellishment choices are excellent. I have followed you by GFC and e-mail. Erin this is sooo Beautiful, I love the texture, colors and the very cool chains. A very special gift for a precious memory!! Erin, this is such a sweet layout! Love your page chains with the gorgeous microbeads:-) And thank you for a chance to win this awesome flower RAK, it is beautiful. This is an amazing page, and an awesome gift for your friend and your beautiful god daughter!! What a wonderful piece! Such gorgeous detail! I'm a new follower of your blog. Thanks for the chance to win! Such a beautiful canvas! I love all the bling. I follow on blog lovin. Another gorgeous creation Erin. 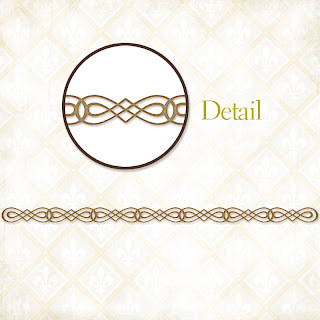 Love all the detail and prettiness. Thanks for your continued inspiration. Gorgeous as always Erin!!! the details are amazing! Beautiful and i am sure that your friend will LOVE it! this is a beautiful project. thank you for sharing. What a lovely page, I really like all the little beads and details. Following and liking. Love the canvas you've made! 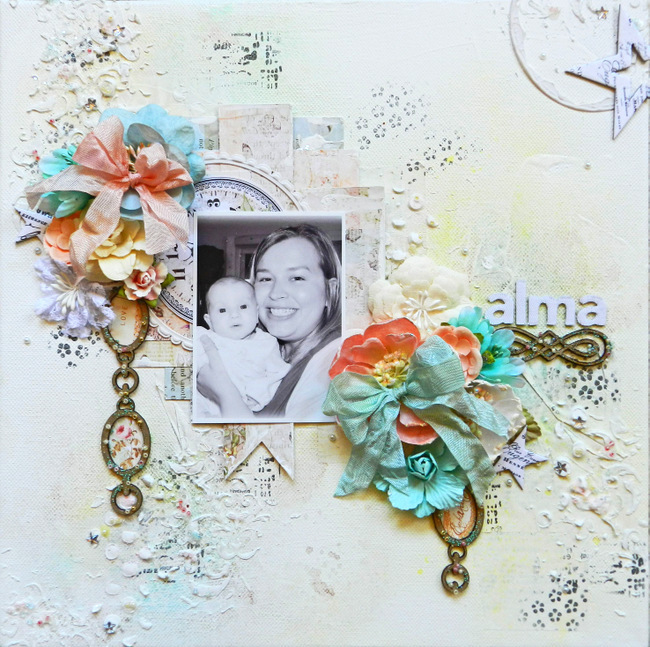 The texture is just gorgeous with all those beads and chipboard pieces! Gorgeous candy you're offering. Would absolutely love to win this. Thanks for the chance! The canvas is gorgeous! She'll adore it! Awww what a sweet canvas. thanks for the chance to win ! Your canvas is beautiful...I love the color and texture. I alm already a follower and I already like your Facebook page. Thank you for the awesome link. The magazine is so inspirational. I adore tutorials especially video tutorials. The canvas for Carrie and Alma is breathtaking. It is the perfect thing for a new mother. I love giveaways, I hope I win.